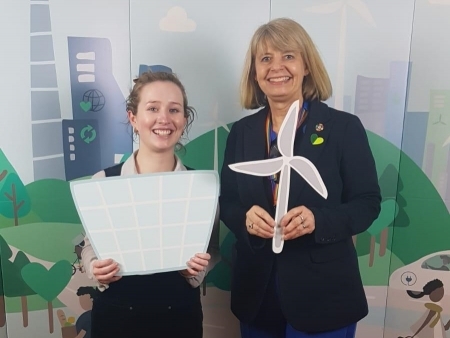 West Worcestershire MP Harriett Baldwin has praised the work of a local school which scooped a green award at a ceremony in Westminster this week. Bredon Hill Academy won an award for the greenest school made by the Climate Coalition at a ceremony hosted by comedian Clive Anderson and TV presenter Kay Burley. Harriett joined more than 40 MPs celebrating the best schools, businesses and local organisations who are trying to tackle climate change up and down the country. The Climate Coalition is made up of more than 130 organisations representing over 15 million people, ranging from aid agencies such as CAFOD and Christian Aid to groups such as the Women’s Institute, WWF, RSPB, and the National Trust. Harriett commented: “Bredon Hill Academy has a stunning track record winning national awards for teaching and it was great to see them grab another award as the country’s greenest school. “Every time I visit a primary school, I am questioned about what the Government is doing to act on climate change and the environment and I am pleased to explain all the important steps we are taking on issues like plastics, emissions and pollution.